Have you ever had a book that you’ve seen over and over and said you’d read but just keep putting off? that’s this book for me. and i honestly don’t know why. I love the cover art, and i like that it’s dystopian and futuristic in a sense. We come into this story after World War 4 has destroyed all that Earth knows from the past for survival and civilization. We meet Cinder at the onset of this story – she’s in her booth at the market where she has a booth to repair things since she’s the ‘best mechanic’ in New Bejiing. On this particular day, she’s waiting for Iko her android to come back with a new foot for her since hers is too small. Oh yes, Cinders not a regular girl, she’s a cyborg- meaning that she’s part human, and part machine. While she’s waiting for Iko to get back, she has the surprise of a new customer, who turns out to be Prince Kai. Completely unexpected since he’s the prince and all, and well, Kai also expects Cinder to be a man, so that was a shock for him. He needs her to repair his personal android for reasons unknown at this point in the story, but we know that it’s important, so Cinder does what she can. Just when Kai leaves the booth, chaos ensues in the market – a child shows signs of a plague that has been spreading, and is taken away. Cinder and Iko leave the market quickly, trying to get out of there unnoticed since there’s this taboo on cyborgs already and she doesn’t want to be blamed for the disease. When she gets home though, things aren’t any better. This is where i enjoyed the comparison to the Disney element here. Of course, Cinder is going to be the ‘red headed step child’ of sorts – with the adoptive mother who doesn’t want her and makes her work as a servant or slave all the time. See, Cinder was found and adopted by Garan, her ‘father’ who rather soon after bringing her home comes down with the plague and dies. Adri his wife then has the obligation of keeping Cinder and raising her with her other 2 daughters who are all fully human and don’t have the stigma of being a cyborg. so you can just imagine the struggle that Cinder has to go through. We have a new take on the Cinderella story in a sense since of course there’s a ball that everyone goes to, where the prince is trying to find a wife, and Cinder’s not allowed to go. It’s her sisters instead who get to go and that makes things complicated – although Cinder knows that being a cyborg means that she’ll never have that happiness. The other story along side this family annoyance is that Prince Kai’s father has come down with the plague and is on the verge of dying. All the while, Earth is trying to work through a treaty with the Lunars – a society that lives on the moon and has these interesting ‘magically’ powers that are unsettling. They can glamour people to see and think whatever the Lunar wants them to. Their Queen, Lavena is especially horrible, given that she’s been said to have killed her family so that she’s the leader. There’s also an underlying story about the search for the cure of the plague, and Cinder is volunteered for testing by her stepmother in a way to get her out of the house, and for Adri to get more money since volunteers get paid. In Adri’s mind, all volunteers die from the research so this is a way to get rid of Cinder as well. What happens though is unexpected – when Cinder is taken in for testing, they learn that she’s immune to the plague and the reason why is very unexpected. So…the lead up in this story is a bit drawn out, but the premise is really interesting. I think that there’s something to be said about taking a story that we all know and giving it a dystopian twist – and in this case Marissa Meyer does a decent job. There’s this side story about the lineage of the Lunar royalty that makes us wonder what’s the true story – knowing that Queen Lavena has had folks killed yet all the while we’re forced to wonder if they are dead? We also want to know the story behind Cinder a bit more since she doesn’t remember her life prior to her hover accident before Garan found her – and that makes things even more exciting. Where this story ends up is a nice cliff hanger – it’s a great way to set up book 2 – Scarlet, since there’s a lot that can happen and a lot htat should happen. We’re left wondering if Cinder will survive her situation, what choices Kai will make, What Dr Erland is really up to and why? and well, what the Lunars are preparing for back home. So much to think about, and i’m sure only some will be answered in book 2. Enjoy! 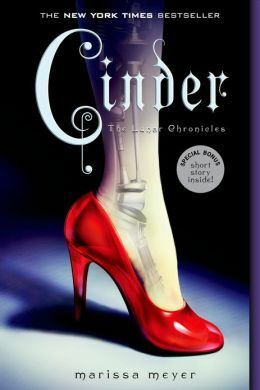 This entry was posted in Dystopian, fantasy, Reviews, Young Adult and tagged Cinder, Dystopian, Marissa Meyer, The Lunar Chronicles, YA by iscm13. Bookmark the permalink.